Have you seen Family Tree Magazine's new website? It's amazing! Not only am I a devoted reader of their magazine, which is a fabulous resource in and of itself, but I have been a regular user of their website for quite a while, recommending it as a necessity to the students of my online genealogy courses. Completely apart from their magazine, this website is a must-visit one for anyone serious about their genealogy. I particularly enjoy the 101 Best Websites of the Year lists they've been running for a number of years now, plus all the heritage resources. The site now has a new, clean look with easy-to-find links to the many resources available: links to articles, free forms and charts, state research guides, videos and podcasts. Nearly everything on this site is free, and the few for-sale items (such as their helpful state research guides) they offer are priced are very reasonably. You can now order them easily online! Family Tree Magazine has worked hard to create an online presence that's user-friendly, and their forums and blogs are great places to interact with others and stay abreast of all the current genealogy news. Many of the links now have RSS feeds, so you can be alerted whenever there are updates! You do not have to have a subscription to their magazine to access the site, but I'm telling you, once you see how wonderful it is, you'll want to subscribe! The magazine offers articles of interest to those at any level of research experience: beginner, intermediate, and advanced. I encourage you to check out the website and seriously consider subscribing to their magazine. WorldVitalRecords.com just published its 100th issue of its free newsletter, the Family History Bulletin. You can take a look at some of their original newsletters and see how it's evolved over time. They've also announced a new partnership with the Dundurn Group to bring more than 400 genealogical and historical books online. And lastly, they are still offering their World Games Special of $88.08 for a one-year membership to their world collection, a savings of over $60. This Labor Day weekend, you can save $$ on some of your favorite genealogy products. From today through 11:59 PM EDT, Monday, September 1, 2008, you can order any product available at www.genealogical.com at a discount of 15% off the current selling price of the books(s) or CD(s) of your choice. To take advantage of this holiday discount, simply add the special code LD08 (caps, no spaces) in the Discount Code box on the “Calculate Shipping and Discounts” page of the check-out process. You can use your special LD08 discount code as many times as you like, so long as you place your final order by 11:59 PM EDT, Monday, September 1, 2008.
hundreds of Genealogy Warehouse books already reduced by 40%-50% or more. www.genealogical.com is the online home of Genealogical Publishing Company and its affiliate, Clearfield Company. For general information about our companies and their products, please e-mail us at info@genealogical.com. To order on-line, please e-mail us at sales@genealogical.com. 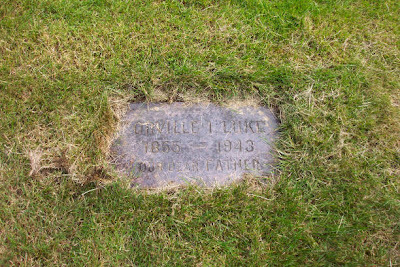 Source: Gravestone of Orville Isaac Luke, Park Hill Cemetery, Vancouver, Washington. Digital photograph. Privately held by Miriam Robbins Midkiff, [ADDRESS FOR PRIVATE USE,] Spokane, Washington. 2004. A number of years ago, before I was a member of the Eastern Washington Genealogical Conference, I attended one of their annual October workshops, and noticed a three-volume set of books for sale on their auction table. Excitedly, I realized that it was Park Hill Cemetery (Vancouver, Washington) published by the Clark County Genealogical Society, and although I really couldn't afford it at the time, I purchased the set, because I knew many relatives of my husband were buried there. After I got it home and started looking up his various surnames, I began to realize just how many of his family members were interred at Park Hill. Many names of collateral relatives--siblings of some of my children's father's great-grandparents who actually were buried in other cities altogether--were found listed in the books. These transcriptions are now available online, so I have passed on the volumes. We try to visit my children's paternal grandfather at least once a year (it's a 360-mile one-way trip), and four years ago, we visited on Memorial Day. I thought it would be a perfect time to visit area cemeteries and we made the most of it that weekend, visiting three cemeteries within 55 miles. While we were mostly recording my children's paternal family's burials, one cemetery held the graves of one set of my great-great-grandparents; two of only four ancestors of mine buried west of the Mississippi River. This grave of Orville Isaac LUKE, although surrounded by others, is "alone" as far as not having other apparent family members' graves nearby. Orville was the third of 14 children of Isaac LUKE and Rebecca HEWITT, and an older brother of my children's father's maternal great-great-grandmother, Angelia Rebecca (LUKE) MARTIN. I have not researched Orville nor his family, but what little information I have shows that he was born 17 March 1855 in Wonewac, Juneau Co., Wisconsin; that he was married first to Laura JOINER on 23 September 1883 in Ironton, Sauk Co., Wisconsin; that he later married Chloe May SMITH and had at least one child, Homer Oscar LUKE, b. 10 May 1892 in Bon Homme Co., South Dakota. When Orville died 23 March 1943, he was buried in Section D of the cemetery. Homer was the lot owner, but he and his wife Jennie were buried in Section V. Chloe, whose cemetery information states that she was born in Minnesota in 1871, died 21 April 1937 (probably in Vancouver) and was buried in Section C. There are also three other Luke family members buried in two other sections of the cemetery, and until more research is done, it is not known if they are related. I find it curious that this family did not have a central plot, but perhaps they could not afford to do so, and bought each plot as needed, based upon what was available and what they could afford. Who were they? How did they get here? Where did they live? Did they move? Do you still have family in Canada? Share with us a bit about your Canadian roots. September 21st is the deadline for submissions. Use the carnival submission form (http://blogcarnival.com/bc/submit_5009.html) to submit your blog article for the Canadian Genealogy Carnival. Thomas of Destination: Austin Family today posted the Closing Ceremonies of the Genea-Bloggers Group Games of 2008 (great job, by the way, Thomas!). Included in his statements was the announcement of the 2010 Genea-Blogger Group Games, hopefully to be hosted by our Canadian Genea-Blogging friends, as a tribute to the Olympic Games being held in Vancouver, British Columbia. A platinum medal for "Citing Sources." A diamond medal for "Organizing Research." A gold medal for the "Write, Write, Write!" category. A second gold medal for "Genealogical Acts of Kindness." I'm honored to have received all of these medals. I'm especially pleased by the level of participation and the hard work performed by all those who joined. Kudos, too, to the fans who cheered us on despite not being able to join due to other commitments. As I read through the final tallies postings of those who "competed," I see again and again the theme of how the different events caused many of them to stretch beyond their comfort zones in technology and social networking, raise their standards of research and writing, become motivated to be more organized, and raise their awareness of the necessity of backing up their data. I'm especially pleased by how many medals were earned in the "Acts of Kindness" category--pleased, but not surprised. Genealogists, family historians--whatever term you prefer--tend to be the most helpful, kind, and sharing group of people I've ever had the pleasure of meeting! What a wonderful way to wrap up the summer! As I head into the school year, I look forward to what the genealogical year will bring, both in my local society and in my online networks. Jessica Oswalt of Jessica's Genejournal has just posted the 10th Edition of the Carnival of Central and Eastern European Genealogy. The theme for this carnival was a carousel one (choose your own topic), and there were five submissions by five bloggers. Congratulations to Jessica on this milestone edition! Ten carnivals are really quite an achievement, and I know sometimes it's been difficult to get submitters, mainly--I believe--because of what is perceived to be a limited scope of ancestry about which to blog. I'd like to remind my readers that Central and Eastern Europe covers a large variety of countries, cultures, and ethnicities, so consider writing a post and submitting it for a future carnival. I've participated in the past, even though I have no Eastern European heritage and very little Central European ancestry (just a drop of German in these veins!). Be sure to drop by and read the carnival posts and--oh, yes--say "Happy Birthday!" to Jessica while you're at it! [The 11th] edition will be hosted by Steve Danko. The topic, as suggested by him, will be on: "First (Given) Names: Did any of your ancestors have an unusual given name? Have you discovered the meanings behind the given names of your ancestors? Did your ancestors use any naming patterns for their children? Are there any given names that are particular common in your family history? Did any of your ancestors have given names that you particularly like or dislike? Does your family celebrate "Name Days"? Did your immigrant ancestors change their given names after they arrived in America? Tell us about the first (given) names in your family. You can concentrate on one name, a few names, or you can go wild and write about the first names of all your ancestors!" Submissions for the next edition are due on September 21, and the edition will be posted on September 24. You can submit your article here. This lovely young couple is the brother and sister-in-law of my paternal great-grandfather, William Bryan ROBBINS, about whose exploits in Russia in World War I I've written quite frequently. Lloyd was Bryan's older brother, and the oldest child in the family after their eldest brother, Floyd, tragically died of pneumonia (or was it from accidentally eating poisonous mushrooms? the debate rages!). Lloyd also served in the U.S. Army during WWI, in the 32nd ("Red Arrow") Division; unlike Bryan, he served in the trenches in France. When the war was over and everyone finally came home, there were two weddings in one week for the Robbins family to celebrate: my great-grandparents (Bryan and his sweetheart, Marie LEWIS) were married Christmas Day 1919, and Lloyd and Josephine were married New Years Day 1920. 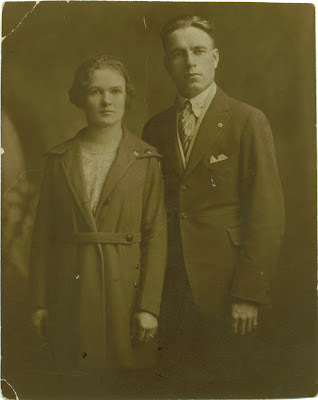 Lloyd was 25 and Jo was 21 on their wedding day, which took place in Grand Rapids, Kent Co., Michigan, although they first lived in Muskegon Heights, Muskegon County, where Lloyd continued his carpenter work. By 1930, they lived in Paris Township in Kent County. The Depression did not seem to be hurting them any, as they lived in a fine house, worth $3500, at 320 Montrose Street. Lloyd was working in the construction industry, still as a carpenter. This couple never had any children of their own. Perhaps to keep herself occupied, Jo began to research her Huff family tree, as well as Lloyd's. She was the first Robbins Family Researcher in our family, and I'm proud to carry on her research. She was also an active member of the Western Michigan Genealogical Society, of which I am a past member. Lloyd and Jo were married for 58 years before he passed away in 1978 at the age of 83. Jo lived another nine years. They are buried in Plainfield Township Cemetery in Kent County, Michigan. I was offline for most of the past week, but I wanted to highlight to those few of my readers who do not read other genealogy blogs that the 54th Carnival of Genealogy was posted earlier this week. Donna Pointkouski of What's Past is Prologue was the guest host for this carnival (and did a fabulous job, by the way! ), whose topic was "Your Family Language." Twenty-nine bloggers wrote 30 posts about their genealogical Towers of Babel; mine is here. Call for submissions! With Labor Day and the end of summer right around the corner it’s time to think about going back to school. So, the topic for the next edition of the Carnival of Genealogy will be: Show and Tell! Remember that fun little exercise you used to do in your grade school days? Here’s your chance to do it again Show us and tell us about an heirloom, a special photo, a valuable document, or a significant person that is a very special part of your family history. Don’t be shy now, show us what you’ve got! This is all about bragging rights so don’t hesitate to make the rest of us green with envy! This is your chance to brag, brag, brag, without seeming like a braggart (you can’t be a braggart when you’re merely following directions ;-)… so show and tell! This next edition will be hosted by Jasia on the Creative Gene blog. The deadline for submissions will be September 1st. Submit your blog article to the next edition of the Carnival of Genealogy using our carnival submission form. Past posts and future hosts can be found on our blog carnival index page. See ya next time! 2. Back Up Your Data! : I bombed in this category only because it has taken so long for Carbonite to backup my files...and it's not their fault. We have had the desktop off for the last week (using only the laptop), plus every night since we started the backup process. It's at 38% completion (yes, I have a LOT of data to back up). I have to say that if Thomas hadn't created this very necessary category, I probably would never have gone to Carbonite, and so this category was well worth entering and the cost of an account ($50 a year) is well worth the peace of mind knowing that if something were to happen to my computer, my genealogy, home files, and digital photos would be secure. I had hoped to do better in Category 5, but I ran out of time to search for bloggers who had not already been asked to join the Genea-Blogger Group. I als did not join another society because I paid a professional to do some research for me, and my funds were limited. I really enjoyed the Games, even though I couldn't participate more fully than I wished. From reading the other blogs, it seems like everyone enjoyed themselves as well, despite many challenges (just like the real Olympics). This really was inspiring, wasn't it? Thank you to my partners, Thomas MacEntee and Kathryn Doyle, for all their assistance, and to all the Genea-Bloggers who participated! Don't forget, Scanfest is tomorrow! The Public School Insights blog just released an interview with Harvard Professor and cultural critic Henry Louis Gates, Jr., who captured some 25 million viewers with his riveting PBS documentary series, African American Lives. Using genealogical research and cutting-edge DNA science, the documentaries trace the family history of 19 famous African Americans--including Oprah Winfrey, Morgan Freeman and Chris Rock--to create a rich and moving account of the African American experience. You see, if you and I... went into an inner-city school and said, 'We're going to drag you into historical archives about the Civil War,' or the Great Depression, or the Great Migration, kids would say, "Get out of town.' But if we said, 'We're going to trace your family through those periods and to those periods,' my goodness, who wouldn't be interested in that?... My idea is to use the fascination with one's collective self, one's familial self, to seduce people back into learning. I won't be posting much this week, as my husband is on vacation from work and we have a couple of house guests. Blog comments won't be published until I have time to read them over. Keep those Games going, people! I Goofed! Please Welcome Diane Rogers to the Genea-Bloggers Group Games! Well, I really did it this time! I actually left a Genea-Blogger out of the Opening Ceremonies [hangs head]. M. Diane Rogers of CanadaGenealogy or "Jane's Your Aunt" wrote her post describing the category she was entering, then left to go to a conference at the Library and Archives of Canada. Meanwhile, we had amended the participation rules which included creating a heritage flag and sending me the information for the Opening Ceremonies. Diane was gone and returned after the Games started. She's been plugging along, regardless, and as a subscriber to her blog feed, I finally clued in last night to a remark she had made in her latest post about not making it into the final group of contestants. Well, Diane, you're very much a part of our Games, and I feel simply terrible I left you out. You're now marching along quite merrily in our Opening Ceremonies between Bluebonnet Country Genealogy and The Cheek That Doth Not Fade. To all my readers and co-participants in the Games, please go give Diane a visit! On October 15th, Blog Action Day, bloggers around the world will unite to write about this year's theme--poverty--in a way that somehow connects to the theme and character of their blog, whether they blog about genealogy, or financial planning, or weight loss. I registered to participate and encourage other bloggers to do so, too. Curiously enough, I have wanted to write a post, or a series of posts, on poverty: what it is, how it happens, how it affects families and generations. As many of my readers know, I work as an instructional assistant in a special needs classroom at a middle school (junior high) for Spokane Public Schools. What many do not know is that the building in which I work is located in one of the most poverty-stricken neighborhoods of the city. While working with the special needs students is always a treat, being around the regular ed. students isn't always so. Their behaviors, choices of words, and attitudes are different than what I'm used to in my familial setting, and sometimes it is uncomfortable to be around them. They come from a different culture than I do; the culture of poverty. "What?" you say. "Poverty is a culture?" Indeed it is. So is middle class; so is wealth. 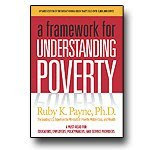 Seven years ago, an award-winning elementary teacher I had the privilege to assist gave me a book to read: A Framework for Understanding Poverty, by Ruby K. Payne, Ph.D. A principal who worked in the inner-city school districts of Houston, Ms. Payne observed how there are middle class "hidden rules" (expectations) in school settings which were placed upon students of poverty. Faculty from the middle class culture could not effectively communicate with and address issues of these students and their families, causing strife and interfering with learning. A Framework for Understanding Poverty was the result of these observations and her work in instructing teachers in how to address the needs (educational, social, emotional) of their students in ways that they could understand and accept, especially so they can be successful as adults working in careers where middle class expectations are the norm. Ms. Payne states that "each individual has resources that greatly influence achievement; money is only one [my emphasis]. Poverty is the extent to which an individual is without these resources." She also delineates between two types of poverty: generational and situational. Generational poverty is defined as being in poverty for two generations or longer. Situational poverty involves a shorter time and is caused by circumstance, i.e. death, illness, divorce. After reading this book, I understood so much more the differences in the way my home life was (middle class culture) compared to my childhood friends (Native Americans in poverty). Even though our cultures (both social and racial) were different, I was familiar with theirs, and it was difficult for me to transition to a society of mostly middle class Caucasian culture when we moved to Washington State. As I studied different lines within my family tree and that of my husband's, I could see how incidents (war, disease, an economic depression, or the death of the head of a household) caused situational poverty for some of my ancestors or their relatives. Sometimes those families survived and overcame poverty, because they had other non-monetary resources on their side. Other family lines did not, and some of them became subjected to generational poverty. These are some of the things I hope to address in my post on Blog Action Day. This coming Sunday, August 24th, from 11 AM to 2 PM, Pacific Daylight Time will be our next Scanfest event. Scanfest is a time when family historians, family archivists (you know, the ones that inherit all the "stuff" when Great-aunt Mildred dies! ), antique photo collectors, and genea-bloggers sit down with their scanners and scan their precious photos and documents, which of course, can be very monotonous. So we jazzed it up a bit by adding chatting using Windows Live Messenger! If you would like to join us, please follow these steps for a smooth start-up and an enjoyable time getting to know others. You will want to do this BEFORE Sunday to make your experience go more smoothly, and so that I will not be spending the first hour or so getting everyone set up, and can do some scanning myself! The last couple of days have been extremely busy for me, so I didn't get anything accomplished toward the Games. I taught a class twice yesterday morning on Using WorldVitalRecords.com for my genealogy society, then have been very busy with responsibilities around the house. A. Prepare a comprehensive backup plan for your digital research files and a security plan for your hard copies and photos - I did some thinking on this the other day, now I need to put it in writing. C. Backup all your data using a flash drive, an external drive, CDs, DVDs, or an online resource - I'm still in progress on this. I can't speed up the process because it's an online backup program and the initial one takes many days to achieve. E. All your data is backed up digitally and secured physically and you can recover from any disaster while losing only one month or less worth of research - hmmm, I may have to revise my original goal of achieving this, because while I can all my digital data backed up, I don't have the time to secure all the physical data right now. Also, much of my plan for securing my physical data includes scanning or photographing it, loading the copy onto my computer and backing it up online. A big problem right now is that I'm running out of hard drive space. A. Organize at least 20 hard files or ancestral items (books, fabrics, inherited items) into file folders, boxes, envelopes, containers, etc. ; archival-quality where appropriate. I started this and need to complete it. F. Create a master list of your files and notify your family members of where it is stored. - I don't need to do a sixth task (only five are needed for a platinum medal), but I want to do it and it was my original goal to do the minimum of six tasks in this category. I achieved my original goal of earning a gold, so nothing further will be done in this category. C. Invite other genealogists to join Facebook. - I'd better hurry up on this one; they're all getting taken! E. Participate in an indexing project. - I had hoped to do some indexing at the library yesterday after teaching my classes, but had to run some errands before shops closed for the weekend. Maybe I'll do a little indexing at FamilySearchIndexing today. F. Join a genealogical, historical, heritage or lineage society. - I've got three in mind, actually. Meanwhile, many of us have kind of hit a slump. I think we need to stop a minute and get inspired to keep pushing through to the end...keep your eye on the goal...focus on those medals...and turn on your speakers! I didn't have as many "finds" this past week. I spent quite a bit of time inputting data from a Descendancy Report shared with me by the wife of a distant WILKINSON cousin. Her information appears to be mostly oral family history, and as this family lived in Canada for many generations, I decided to see what I could find online. I used the vital records indexes for both Manitoba and British Columbia to verify or correct information in the report. The report listed William WILKINSON (the person from whom the descendants were listed, and brother of my 3rd-great-grandfather John) with a death date of 25 September 1934, but no death location. His wife's death information stated she died 26 February 1947 in Victoria, British Columbia, so I checked the BC vital records index using William's name only, and found a listing for a William WILKINSON who died 25 September 1939 in Victoria. This is very likely the same William, and to confirm, I wrote a RAOGK volunteer to request obituaries for both William and his wife Mary Magdaline (THOMPSON) WILKINSON. I'm just amazed and thrilled with the amount of Canadian information available online these days, from the provincial vital records indexes to the census records indexes and images that are being provided by a variety of websites! It's getting easier and less expensive to trace my Canadian ancestors and relatives these days. I also used information found at FamilySearch's Record Search pilot website in Michigan vital records and found marriage records for two of William's sons. Speaking of Michigan vital records, stay tuned to this blog next week for a series on these records. Another Canada - Michigan link in my family tree is my M(a)cARTHUR family. A cousin sent me a photocopy of the obituary of my 3rd-great-grandfather, Daniel J. MacARTHUR. He was born in Canada and immigrated to the United States, as his obituary confirms. It also confirms he was buried in the Hill/Danley/Phillips Cemetery in Fulton Twp., Gratiot Co., Michigan. The obituary gives his death date (March 10; and other records state the year was 1919), then says "Funeral services were held at the house Thursday and the remains brought to St. Johns [Clinton Co.] and laid to rest Friday in the Danley cemetery on the Gratiot county line." I used the calendar tool in my RootsMagic program and entered "1919" to view that year. I determined that Daniel died on a Monday; the funeral was March 13th, and the burial was the 14th. If you do not have access to a program like this, you can find calendar calculators online. As I always am, I was intrigued by the listing of the number of descendants in his obituary: "seven children, four boys and three girls, 22 grand children, and 7 great grand children..." Have you ever looked an obituary and then tried to figure out to whom exactly these numbers refer? You may discover additional descendants! Be aware, however, that these numbers can be incorrect. When my paternal grandfather died, the wrong numbers of grandchildren and great-grandchildren were listed in his obit; no matter how I rearranged the possibilities with adoptive and step-descendants, it didn't work out. Somebody simply goofed, and that's often what happens when people's minds are filled with grief and/or the overwhelming duties of filling out paperwork for death certificates, obituaries, probate proceedings, etc. Although not a "find," I decided to see if I could find cotton gloves for sale here in town, instead of having to purchase a large box of them online through an archival supplier. I've been needing to get some to use while handling old family photos, documents, and heirlooms. At the last Scanfest, someone mentioned purchasing them at art supply stores. I called Spokane Art Supply; they were out of stock momentarily, but recommended Inland Photo up the street. The photo shop employee told me they had two pair of one-size-fits-all regular cotton gloves for $8.95 (not appealing, since I have very small hands), and one pair of anti-static ones in either small and large for $14.95. I'm going to check them out later today. I don't need anti-static ones, because I'm not using them to work on electronics, but they may be the better choice for comfort and fit. In the 50th episode of the Genealogy Gems Podcast, Lisa Louise Cooke chats with Tim Russell of the radio show and movie A Prairie Home Companion about his passion for family history. "I've always been interested in history, I guess. I'm the only one in (my) family who has expressed some interest in roots and where we all came from." With his interest in history, it's fitting that Tim has a career that hints of a bygone era - that of a radio show actor. "We're kind of the last stand for that. But I think Garrison's (Keillor) writing is a prime example of why it should somehow continue. Because it's a great medium. It really puts your imagination to work...and that's why we enjoy it. For the most part, we're doing things live and that gives it a little extra ZING!" Tim also gives the inside scoop on what it was like to work with the likes of Meryl Streep, Woody Harrelson, and Lily Tomlin on Robert Altman's movie set. Also in this 50th episode Lisa does a bit of genealogical daydreaming with fellow genealogy podcasters The Genealogy Guys, DearMYRTLE, and Mike O'Laughlin among others. Genealogy Gems Podcast is an audio show available FREE on the Web at www.GenealogyGems.TV and through iTunes. Host Lisa Louise Cooke provides genealogy research strategies to help listeners get the most out of their research time, and creative ideas for sharing and displaying their family history. Genealogy Gems Premium offers listeners complete access to all features of the website including members-only podcasts and videos, Message Forum, Newsletter Archive, Genealogy Puzzles, and Behind the Scenes information. Monthly and Annual subscriptions are available. Lisa Louise Cooke is the host of the Genealogy Gems Podcast, and The Family Tree Magazine Podcast. She is the author of the book Genealogy Gems: Ultimate Research Strategies (Lulu.com $15.98), and a national genealogy speaker. Every family has its own unique language, words and phrases that have been passed down through the generations from the Old Country and influenced by the dialects and idioms of the various regions that family lived in once they arrived in North America. I can think of two phrases that were used frequently when I was a child in the Alaskan Native community of Klawock, an old Tlinget fishing village on Prince of Wales Island in Southeast Alaska. The first was "I jokes!" This was said after you had teased someone or had made a joke. Although spoken in English, it obviously was incorrect grammar. Probably it was a form of pidgin English spoken by my playmates' grandparents and great-grandparents when they were children in the early 1900s, and had simply been handed down over the generations. I remember my parents trying to break me of this phrase by telling me that I should say "I'm joking," but that sounded odd to my ears; stiff and almost pretentious. Another phrase that was often used by my parents was a Tlinget phrase which sounded like "ee shawn". Now, I know that is not the proper Tlinget spelling of it, but what it meant was "you poor little thing" in a very sarcastic way. If I was whining about something, you can be sure I would hear "ee shawn"! There are lots of phrases and words that are unique to the family I have now, my husband and children, and extended to the in-laws. Some of these are words with made-up definitions that come from our favorite group game, Balderdash!, which we play almost every night when we go on our annual camping trip to the lake. The adults and kids (who are now either young adults or teenagers) will sit around in the cabin with their drinks and snacks and one person will read a word from a card. Everyone has to make up a definition and secretly write it down on a scrap of paper, along with their name. The reader must write down the correct definition from the back of the card. Then everyone gives their definition to the reader, who mixes up the scraps of paper. He or she then reads each definition, without revealing the identity of the one who wrote it, and everyone votes on the ones they think are the real definition. If a person guesses the true definition, they get two points. If someone votes that one of the fake definitions is real, the author of that definition gets a point. Then the person to the left of the reader becomes the next reader. The game continues until someone reaches an agreed-upon amount (say, 50 points). We love this game because we get so silly that sometimes we're laughing until the tears run down our faces. One of these times, to be sure, we're going to be asked by another group at the resort to quiet down! Some of the made-up definitions sound so good, and sometimes the real ones sound ridiculous. I remember my brother-in-law made up the following definition for succaleg: "a Yale sporting cheer chanted by fans at games." We still yell "succaleg, succaleg!" at each other when we go camping! And then there's kiddle, which someone else "defined" as a type of greeting done by touching elbows. Every once in a while, my daughter and her cousin will walk up to each other, touch elbows, say "kiddle" and start giggling. Family languages can be annoying or entertaining. What words or phrases does your family use? Written for the 54th Carnival of Genealogy. Family history is marked by major life events: births, marriages, deaths. There are christenings and baby dedications, graduations, and retirement parties. One special event most of us can remember is getting our Senior portraits done. My daughter and her boyfriend had their portraits done by our niece, Jennifer Midkiff Fawbush, a professional photographer who lives in the Chicago area with her husband and two little girls. They've been staying here with Jennie's parents for the summer while her husband completes his Guard duty at Fairchild Air Force Base, and will be going back to Illinois next week so he can return to seminary. Missy and Ryan are featured on Jennie's blog and website (go to Enter Site, then choose Your Story from the menu). It's hard to believe we're at that point in our family history where our daughter prepares for her last year of high school! If you live in the Chicago area and are looking for a photographer to capture your special moments in family history, you won't be disappointed by Jennie's talent. Check out My Story and Your Session on her website to see her philosophy behind her art. And enjoy the beautiful music while you feast your eyes!